Garden Ideas to Get You Ready for Spring! Take stock of your patio furniture. Outdoor furniture is exposed to the elements for much of year, which means that fabric will eventually start to disintegrate, wood will start to rot, and plastic will start to mildew. Do a once-over of your furniture to see what can be repaired, and what is damaged and needs replaced. Take advantage of pre-season sales, when prices are lower, to upgrade your outdoor furniture or try a new style. Plant perennials. Weeds have an unfortunate tendency to start popping up as soon as the ground thaws, so stay on top of them so that you’re ready to go when it’s time to start planting. Reference the Plant Hardiness USDA Zone Map to help you figure out the best time to plant, and when the time comes, plant those perennials! If you just can’t wait that long for some blooms to brighten your outdoor area, set out some small flowering baskets or flowering containers that can easily be moved indoors at night until you can start planting in the ground. Build a fire pit. A fire pit is something that can be enjoyed almost year-round, and makes a great gathering spot for your outdoor entertainment area, especially in the seasons it gets chilly at night. While you can get as fancy with your fire pit as you want, it’s remarkably easy to make an inexpensive fire pit if you’re not worried too much about its appearance. In addition, by adding a wooden cover to your fire pit, it can double as a table during the day. Add some atmosphere. If you want to feel like you’re on a tropical oasis, outdoor curtains are a must. Use a light, billowy material and scatter ferns and other greenery around the space to achieve the full effect. The curtains can easily be hung around a porch or pergola using a curtain rod and hooks, and will give your outdoor space a more secluded, intimate feel. Protecting your garden and landscaping from soil erosion caused by overflowing gutters this spring is also important. The best way to do this is by investing in a gutter protection system and using only the best gutter covers, which you can get from Gutter Helmet®. 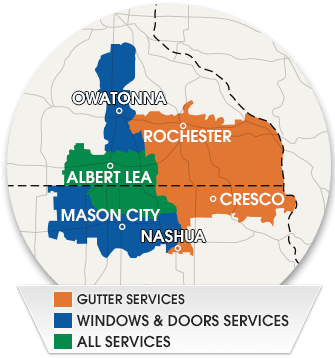 When you’re ready to have your gutter guards installed, all it takes is a quick call to (507) 373-3435.